Independent heating, telephone, TV, wirless Internet connection. On the square in front of the building there is a food market open all morning. It is located behind the splendid "Parco Scipione" and "Terme di Caracalla", served by all kinds of shops and activities, equidistant from the two metro lines of "Re di Roma" and "San Giovanni", which can be reached in 10 minutes. Well connected with the railway stations, the Historic Center and the Sapienza University, directly served by the 360 ​​and 218 surface transport lines. The apartment is surrounded by parks and tourist sites: the Colosseum, the Baths of Caracalla, the Circus Maximus, the Arch of Constantine, the Celio which can be reached in a few minutes on foot. Sono stata con la mia famiglia in questo incantevole appartamento, curato nei particolari e molto confortevole. La posizione é comoda ai mezzi pubblici e al mercato sotto casa, ma l'appartamento essendo situato in un bel giardino rimane molto silenzioso. Molto luminoso e completo di tutto. Anche per il parcheggio non abbiamo avuto difficoltà . Ottima soluzione per visitare Roma. 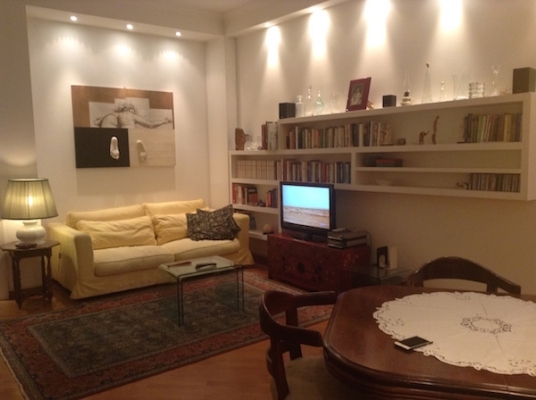 We spent 5 beautiful days in Rome and this wonderful apartment has been part of this magic experience! The flat is spacious, well appointed (with wood floor!) and there are 2 direct connections (bus) with the train station and the main points of interest of the city.